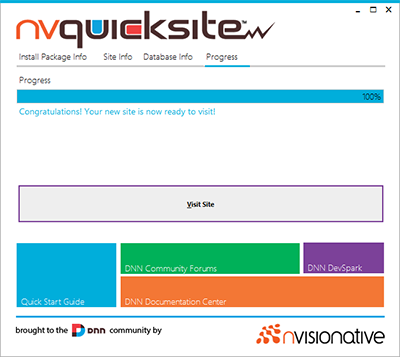 nvQuickSite is a desktop installation app for DNN, the world's most popular ASP.NET-based CMS. This app allows you to easily install DNN onto any environment that meets the minimum system requirements for DNN to be installed. 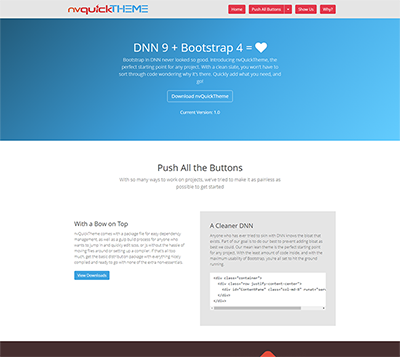 nvQuickTheme is more than just a great minimalist DNN (DotNetNuke) theme. It is a powerful theme building framework and developer workflow. This "starter solution" was made with developer efficiency and the ultimate DNN theme performance in mind.